Yve YANG is pleased to announce the inaugural exhibition of artist David OReilly in Shanghai, a collaboration with Art World to present the exhibition in the venue of 0 Art Space. There will be a live performance by the artist at the opening in the afternoon of November 6th. The exhibition will be on view until November 25th. Born in Ireland and currently living and working in Tokyo, Japan, OReilly is an active artist in animation and games who created the groundbreaking animated films "Please Say Something" and "The External World". He has served as screenwriter for animations as "Adventure Time" and "South Park", as well as producer of "Alien Child" in Spike Jonze’s Oscar-winning film "Her ". OReilly's animation and game productions have won numerous awards including Prix Ars Electronica and the Golden Bear for Best Short Film at Berlin International Film Festival. Among them, the game trailer of "Everything" was nominated for the Golden Bear Award for Best Short Film at the Berlin Film Festival in 2017. As the only game piece in history that was ever shortlisted for film festivals, it also became the first interactive work to qualify for the Academy Awards. In addition, OReilly also participated in several exhibitions and screenings such as David Lynch Foundation, Pompidou Center, San Francisco Museum of Modern Art, Museum of Modern Art in New York and Shenzhen Animation Biennale. This Year, OReilly created "Eye of the Dream" as a commissioned work for Berlin Art Week. This immersive audiovisual installation intends to present the process of life from the Big Bang to the modern world through the act of "dancing": Everything is a member of this choreographed dance, spontaneously arranged in a certain paradigm, interfacing with everything surrounded and compromising during this individual action. In addition to "Eye of the Dream" and its game "Everything", this Shanghai exhibition will also present the artist's animated short film "Octocat Adventures" and a new film inspired by it, "Octocat Story", as well as a special version of the game "Mountain" and three new video works based on this game. "Everything is a simulation of the universe where you can travel around as one thing at a time or as a group at a time. And as you do that, you discover abilities. And one of those abilities is called dancing." "It's one of the most complex parts of the game, but also the most purely decorative. When it was released, a friend of mine played it a lot. And he said dancing was his favorite part of the game because it was so useless. And I really liked that, maybe more than any review. It's sort of gleefully complex and doesn't really have a set purpose in the world of the game. But it's key to how this project tries to describe life." "When I was a child, I was really fascinated by this Irish folk dance known as Cèilidh. I hated dancing, but I was fascinated by observing it and by the nature of it when I learned how it works. Basically, you get a room full of people, no matter how many there are, and by the end of the night, every single person will have danced with every other person in the room, using a simple set of instructions which are the dance. It's a beautiful feat of mathematics. So depending on your point of view, it's either a very primitive or a very elegant and sophisticated form of speed dating. Now, consciously, we don't dance to amplify the social bonds of our tribe. We do it simply because it's fun, because we like doing it, and we enjoy it. I would say precisely because it has no purpose. In almost all the other things we do, we maintain our feeling of control. We maintain this feeling that we're responsible for what we do. But in dancing, our individuality is dissolved. It is shared between every participant. The location of responsibility becomes blurred. Are you controlling the dance, or are other people controlling it, and then you're getting swept up into it? Or even more esoterically, is the dance itself influencing its participants to create itself? And so we can come to see it the other way around—it is not that we are doing the dancing, but it is the dance is dancing us. When we step back from this human notion of dancing and expand the idea of things self-organizing into patterns, we also realized that this activity is not unique to humans. All forms of life and even non-living things appear to self-organize." David OReilly is an artist, film-maker and game designer whose distinctive style has made him one of the most respected and influential creative voices of the contemporary scene. Creator of the groundbreaking animated films Please Say Something and The External World, his work has won numerous awards and been the subject of several retrospectives internationally. OReilly served as the writer for the television shows Adventure Time and South Park, and created the fictional video games in Spike Jonze’s Academy Award-winning film Her. In 2014 he released his first game Mountain and in 2017 released his second game, Everything, which is a metaphysical tour de force that suggests entirely new directions for games as an art form. OReilly’s works were also exhibited and screened at Berlin Art Week, Centre Pompidou, SFMOMA and Shenzhen Animation Biennale. 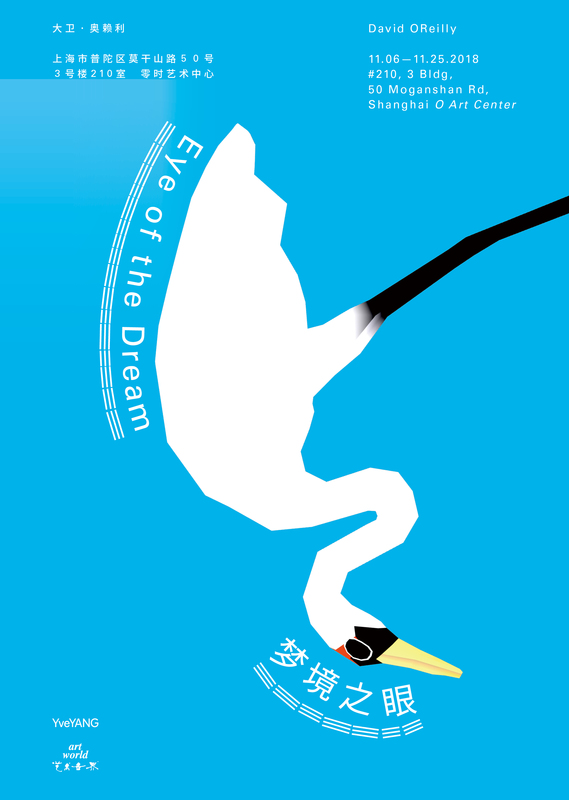 OReilly’s inaugural art exhibition “Eye of the Dream” is now showing within Yve YANG’s space at M50 Art Zone, Shanghai. His second solo show will be coming in spring, 2019 at Yve YANG’s space in New York, Midtown West. At the end of 2018, OReilly will show his recent work “Eye of the Dream” at Guangzhou Triennial. Opening and a live performance by David OReilly will be held on 11.06.2018.